Happy Valentine’s Day! I picked up this lips print fabric in LA at Mood Fabrics a couple of years ago and couldn’t let another Valentine’s Day pass without making something out of it. The only problem is that I only bought a yard, so figuring out how to cut it was rough. Thankfully I had just enough, but there were only tiny scraps leftover after I was done. Whew. I’ll stick to my 2 yard rule from here on out. I found some other really cute lip print fabrics here! Also this one is really cute. I’ve been wanting to make a tie front top like this for a while, and this cute lip print fabric was the perfect excuse. Then we found this pink wall to shoot in front of, and it was a Valentine’s Day match made in heaven. I’m sharing the full step by step instructions below! Note: This is not a beginner sewing project (if you’re looking for those, look here! ), so you’ll need some sewing skills to make this one. If you’re looking to gain some more sewing skills, check out my online sewing guide, The Modern Girl’s Guide to Sewing. If you’re new to creating patterns, I have a free video on the Modern Girl Sewing YouTube channel that walks you through how to create a pattern using your own clothing as a guide. Use those instructions to create your pattern. You’ll need pattern pieces for a BODICE FRONT TOP (cut two of these), BODICE FRONT BOTTOM (two), LONG SLEEVE (two), a BODICE BACK piece, and NECKLINE LINING for the FRONT and BACK of the necklines. Lay your pattern pieces flat on your fabric. Make sure the direction of the fabric’s stretch is across your bust. Pin your pieces to the fabric and cut around them, adding about 1/2″ of seam allowance to each side. You should have ten cut pieces. Step 1. Take your BODICE BACK and BODICE FRONT TOP pieces and pin them together at the shoulders. The right sides of the fabric should be facing each other. Sew across the shoulders with a 1/2″ seam allowance (ie. 1/2″ from the edge of the fabric). Step 2. Take your NECKLINE LINING pieces and pin them together on the shoulder seams with right sides of the fabric facing each other. Sew across each side with a straight stitch and a 1/2″ seam allowance. Trim off the extra seam allowance. Step 3. Now take your NECKLINE LINING and BODICE pieces and (with right sides of the fabric together), line up the lining directly over the neck of the bodice, all the way down to the front ties.. Line up the shoulder seams on either side and pin in place. 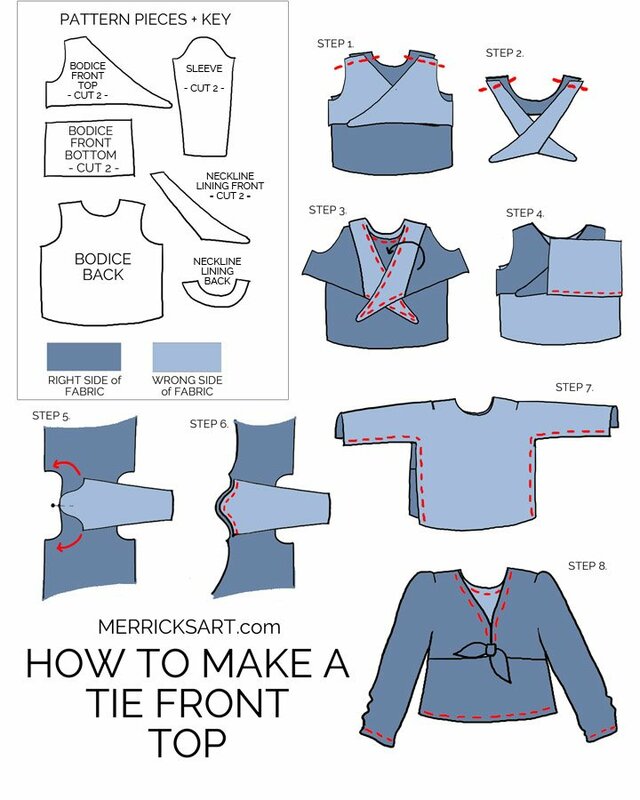 Once it’s pinned all the way around, sew from the end of one tie, around the neck, and back down to the other tie with a straight stitch and a 1/2″ seam allowance. Once the NECKLINE LINING is attached to the top, trim your seam allowance (or serge or zigzag it) and then tuck the lining inside the top. We’ll top stitch this in place at the end. Step 4. Take one of your BODICE FRONT BOTTOM pieces and, with right sides of the fabric together, sew it to the BODICE FRONT TOP. Repeat for the other BODICE FRONT BOTTOM piece. [not pictured] Once the two bottom pieces are attached to the bodice, sew them together in the front. Step 5. Now it’s time for sleeves. Take your DRESS and lay it open flat, right side of the fabric up. Line up the top of the shoulder curve of the SLEEVE with the shoulder seam of the DRESS (right sides together), as shown in the illustration. Pin in place. Now pin down both sides of the shoulder curve, pinning the SLEEVE to the DRESS. Step 6. Once it’s pinned, sew them carefully together, up and around the curve. Repeat for the second SLEEVE on the other side. Step 7. With right sides of the fabric together, pin the top from wrist to armpit, and armpit to hemline. Make sure those armpit seams are matched up. Then sew from wrist to armpit to hemline with a straight stitch. Repeat on the other side. Step 8. Now fold the end of your sleeves up twice and stitch around the opening (use a double needle if you need some stretch! ), and do the same for the hemline of the top, and around the neckline to hold the lining in place. Note: I also added a little whipstitch above the ties because it was too low cut for me. Step 9. Press all your seams flat with a hot iron and you’re done! That shirt is CUTE! You did an awesome job! Love this cute top! Thanks so much for making a tutOrial! What kind of faBric did you use/recommend? Rayon, lightwight knit? Either of those would work great! Even a thicker knit, linen, or polyester would be perfect. I love this blouse. so cool that you made it!! I love your ankle boots! Any chance you would share who makes them? The similar ones you Gave a link to are not as opEn or as coMfortable looking.